Getting there: Walk round the promenade from either San Antonio or San Antonio bay resort. Parking in San Antonio in the car park opposite the start of the promenade. Below the busy promenade, the Town Hall of San Antonio has created a long, wide beach of fine, white sand drawn from the sea. Being easy to walk to, and backed by holiday accommodation, this beach is popular but never appears too full. The waters are shallow, safe, and great for messing about in - perfect for what is largely a youth-focused beach in the summer. Being the closest beach to San Antonio workers' blocks and youth hostels (meaning plenty of PRs on the prowl), in summer it is full of twenty-somethings socialising and relaxing, with music often spilling out from the many bars along the promenade. There are excellent watersports facilities and boat trips can be caught to other beaches from the nearby Harbour. In the evenings the beach is awash in a golden light, and becomes a great place to watch the sun set behind the many boats moored further out in the bay. If you follow the promenade around the bay to the south, you'll reach Bay of San Antonio resirt with several small sandy beaches. There is a wide selection of bars and restaurants along the length of the promenade - you'll be spoiled for choice between the lively, music focused Itaca, the delicious chicken pita meal deals at Ibiza Rocks Bar and the rowdy matches at the sports bar, Linekers, with more relaxed bars further along the bay towards the lavish pool party venue, O Beach Ibiza. Many of venues on this strip serve food during the day, then transform into busy bars with small dancefloors later at night. There's also a small supermarket, an ice cream parlour and - for the hangover days - Burger King, KFC and Pizza Hut. You'll find lots of cosy small hotels and hostels with a family atmosphere and self-catering apartments - the perfect choice for travellers on a small budget who prefer to spend their money in the clubs or on excursions. Try for example the traditional, family-owned Marí Hostel offering great personal service or the economic and cosy Florencio Hostel, a clubber's favourite. 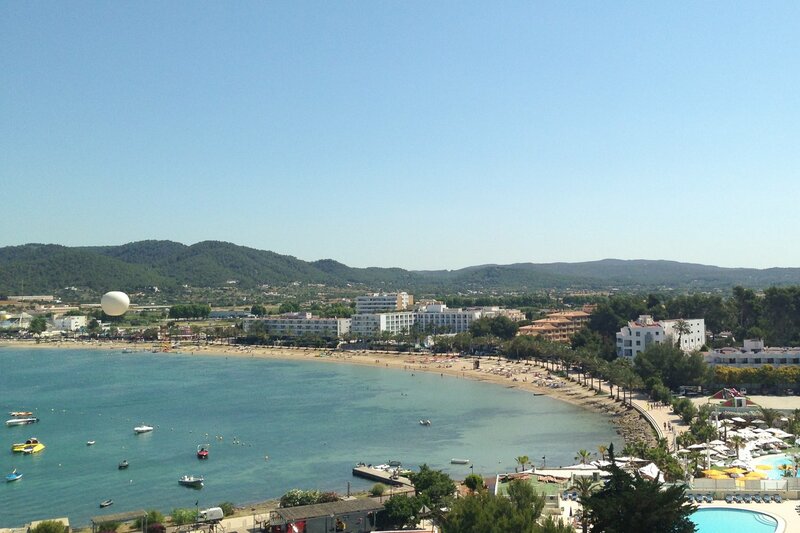 In a quieter part of the town, yet only a short stroll from the centre, you'll find the stylish 3-star Puchet Hotel and the Apartments Marina Playa next to the lovely beach of Es Pouet, both a great choice for clubbers who want to relax in style after long Ibiza nights. A bit further along the bay, Sol House Ibiza offers its own events on the roof terrace with stunning views over the bay. A fantastic alternative to a traditional hotel are the beautiful villas with own pool, barbeque corner and private garden - if you travel in a group you'll be surprised, how inexpensive they are per person! This town villa is located right in town, and only a few minutes away in a hired car there are several country villas near San Antonio. Getting there: Walk from San Antonio centre or walk around the two promenades from the bay area. If driving, parking is good in the nearby streets. Caló des Moro is situated on the north side of town around the bay from the harbour, discovered by following the sunset strip promenade with the famous sunset bars as it curves around to the right. This beach has grown in popularity over the years and, though very small, is now a busy and lively part of Ibiza in the summer months. The sandy cove has limited space, but there is also room to park a towel on the smooth decking area just above the sand. The water is shallow and warm, a great place to have a dip, with rocks along the side for exploring. Tip: Walk to the right of the beach along the coast, past the new developments, to reach the Aquarium situated on the small promontory. Here you can view local marine life - and the small snack bar is also a great sunset spot away from the hustle and bustle of the sunset strip. Come to the sunset strip and know the true meaning of 'spoilt for choice'. Right by Caló des Moro some cute pizza and gelati bars have popped up with a beachy feel, but for something more established, grab a sun bed at the uber-chilled Golden Buddha, try the delicious food at Kasbah or jump in the pool at the sociable Kanya - a favourite bar restaurant and sunbathing spot for young people. Then round the corner it's the names you know - sunset strip heavyweights like Café Mambo, Café del Mar, Mint and Savannah. All venues mentioned are fantastic to view the sunset from. Only steps from the beach you'll find some of the most popular hotels and apartments in San Antonio, for example the Sol Bahía Apartments right on the sea front with wonderful sunset views. Right next to it the Wi-Ki-Woo Hotel offers beautiful decorated rooms with kichenette and a sea-side restaurant and terrace in sparkling art-deco style. Only a few steps further, you'll find the 4-star hotel Cubanito Ibiza Suites, a beautiful art-deco hotel with a roof-top bar with stunning sea and sunset views. By stepping just a short way out of town you can have your own private plot with fantastic holiday villas on offer. Read more about the world famous Sunset Cafés. Have you read our insider's guide to San Antonio?